Two flasks hold colored water, one yellow and the other blue. Set the starting temperature of each flask, choose a type of material to connect the flasks, and see how quickly the flasks heat up or cool down. The flasks can be connected with a hollow pipe, allowing the water in the flasks to mix, or a solid chunk that transfers heat but prevents mixing. Observe that heat flows from warmer objects to cooler ones until temperatures equalize. 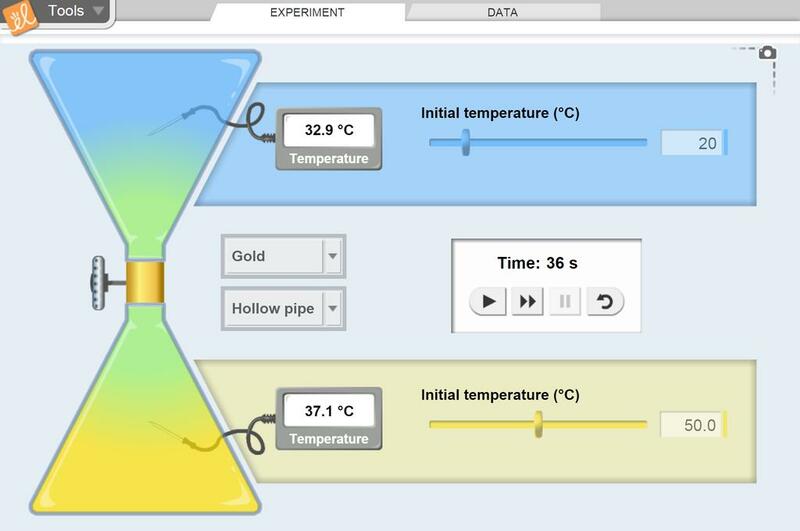 Measure heat transfer via conduction and convection. Observe that metals are better conductors than nonmetals. Determine that hot fluids tend to rise while cold fluids tend to sink. This is a customized student exploration sheet to be used as “seat work”. Suggestion: Review the Gizmo’s ... (more)Teacher Guide and original Student Exploration Sheet to determine which parts of the Gizmo lesson need to be modeled by the teacher. My students loved this virtual lab! It was so well laid out and easy to follow. Great way to demonstrate the difference between conduction and convection. A great activity for Alberta curriculum grade 7 when teaching about the conductivity of different substances!